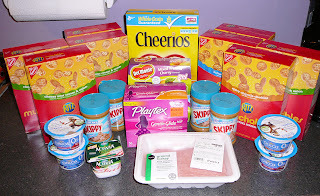 Show and Tell Meg: Fantastic Publix Trip! I also used a $5 off $30 Winn Dixie coupon. My pre-coupon and sale total would have been $65.90, but I only paid 67¢! Wahoo! I don't know that I've ever done that well - I saved 99%! Holy Cow :) That's exciting!